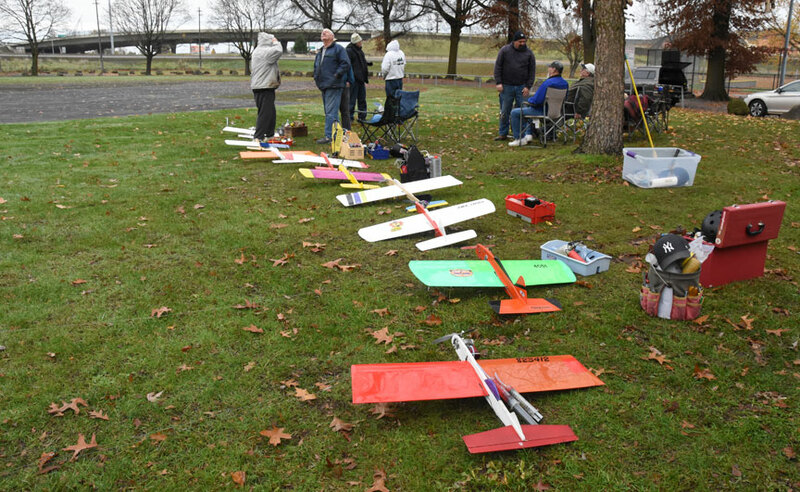 Nine planes in the pits awaiting action in the second November Northwest Sport Race contest hosted by the Northwest Fireballs. Flying Lines photo. 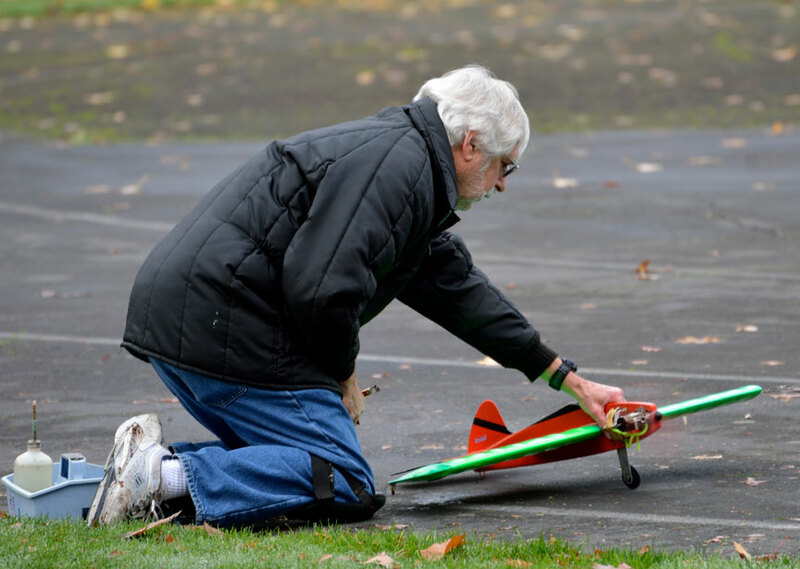 The Northwest Fireballs' idea of hosting a Northwest Sport Race contest in November to cap off the region's contest season caught on with racers in a big way, with a far larger turnout for the 2017 running of the event. Gary Harris directed the contest with the help of several Fireballs members. 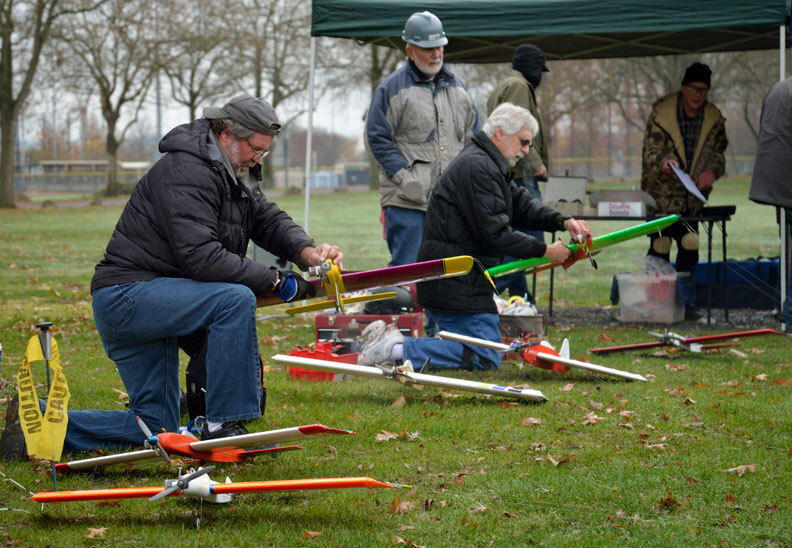 About 10 airplanes were on hand, including entrants and backups, and seven official entries fought for the victory. Three preliminary heats were run, followed by a split feature race featuring four entries in two-up races. Mike Hazel completed a sweep of all the NWSR contests he entered in 2017, with a winning time of 9:03.97. The contest also served as a final demonstration of the ASP .25 engine as a possible addition to the Northwest Sport Race allowable engine list. 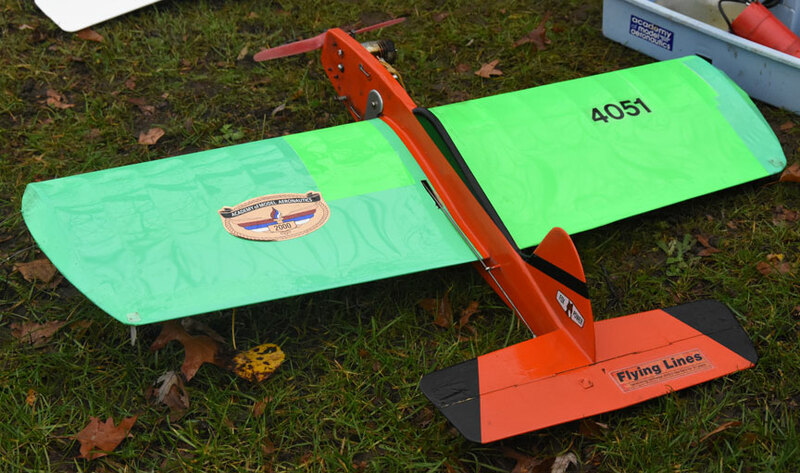 Gene Pape's ASP-powered entry posted a third-place time, but did not receive an official score as it was outside the rules currently in force. 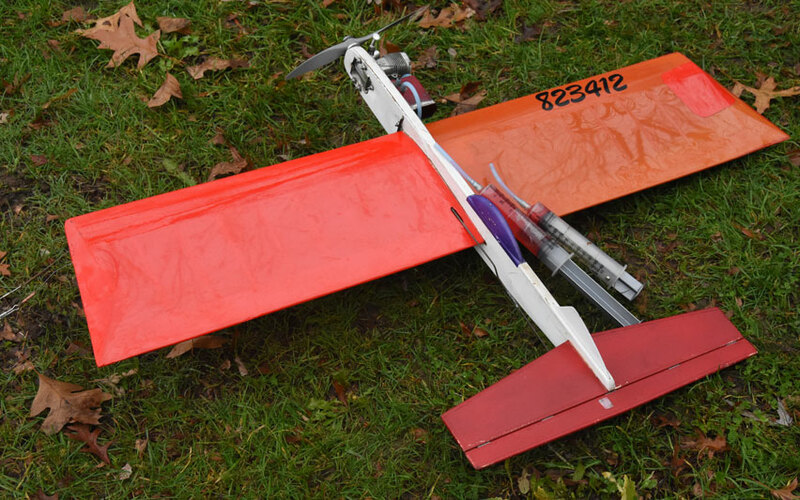 In the air, Pape's ASP-powered Super Clown had identical airspeed to Hazel's O.S. LA .25-powered Artesian. Currently the legal engines are the Fox .35 and the LA .25. A big thank you to: Richard Entwhistle and Barbara White (canopies, food, cooking, and officiating), Darrin Bishop, Don Curry, Dave Royer, Pat Chewning and Dave and Doug Powers (helping and officiating). Thanks to the pilots and pit men for showing up and making it happen. This thing got started a year ago at the weekend of the worldwide Ringmaster fly-a-thon. I had such a terrific flight on a Fox .35 stunt-powered GX Combat plane that I thought that that engine should go on a Northwest Sport Race plane. It just ran so well! The Northwest Fireballs club humored me and we set a date for a Northwest Sport Race to take place two days after Thanksgiving (2016). 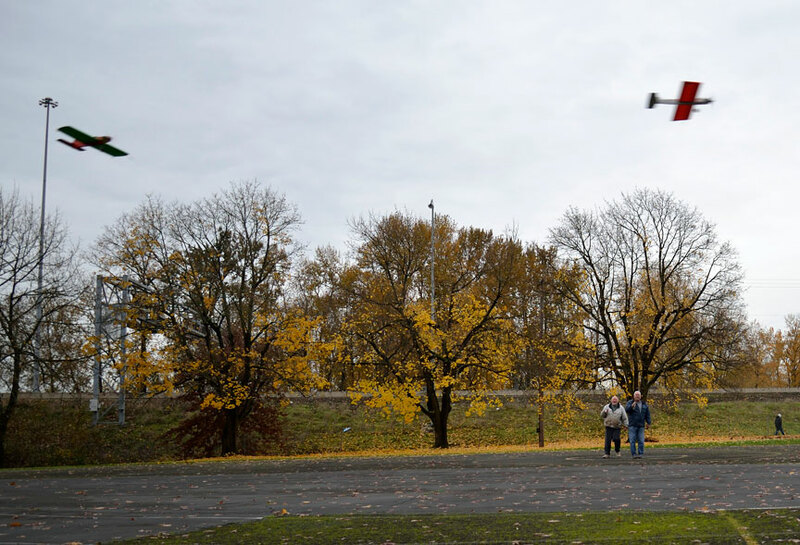 We got lucky on the weather and two teams showed up to fly. Apparently it went well enough that the club members wanted to do it again this year. This year on race day we were treated to good weather and with the good weather came 10 competitors ready to play. We began by having three planes flying in the first 70-lap heat race to be followed by two heat races of two-up each. Then the final would be flown by the four fastest planes. This would be done with two pilots in each of two 140 lap races. When the smoke cleared the fastest plane of the day was Mike Hazel's OS LA .25-powered plane turning in a time of 9:03.97. Before racing began it was agreed that there would be one winner and he would get the money that came from entry fees. 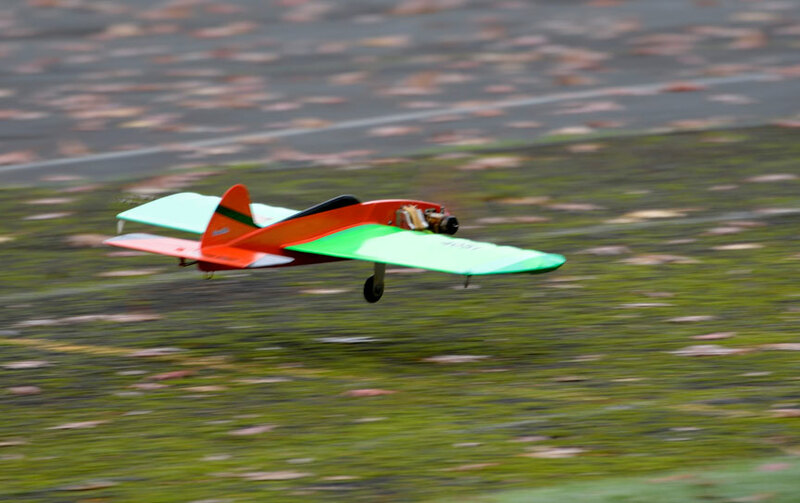 $35 cash went to Mike for his fastest entry flown by John Thompson and Mike pulling pitting chores. I'd like to add that a proposal to make the ASP .25 engine legal for Northwest Sport Race is now in the debate stage with voting to happen soon. Initially I was dubious about adding this engine but have changed my mind and am now an advocate for it's being allowed. A very good quality product which is at this time selling for under $50. This could add new life to racing here in the northwest. ABC, good fit, currently manufactured and affordable. Yes, everybody, start your engines! All the pilots and pit crews with their airplanes, from left: Gene Pape (Super Clown, ASP .25), John Thompson (Super Clown, Fox .35), Mike Hazel (Artesian, O.S. LA .25), Doug Powers (Super Fly, O.S. LA .25), Leighton Mangels (pilot, with Super Fly, O.S. LA .25), John Knoppi (Artesian, Fox .35), Jim Cameron (pilot), Pat Chewning (pilot), Gary Harris (Super Fly, Fox .35), Richard Entwhistle (Super Fly, O.S. LA .25). Dave Powers photo. Racing action in a two-up heat: Mike Hazel (left) flies John Thompson's Super Clown, and Leighton Mangels pilots his Super Fly, which was Doug Powers' entry. Dave Powers photo. Contestants tune their engines before the start of racing: At left, John Knoppi, and at right, John Thompson, both working with Fox .35 engines, as Gene Pape watches. Dave Powers photo. Doug Powers makes a pit stop. Dave Powers photo. Mike Hazel gets ready to corral his Artesian, which is trying to turn into the circle as it approaches the pit. Dave Powers photo. John Thompson releases his Super Clown from a pit stop. Dave Powers photo. Thompson's Super Clown takes off, piloted by Mike Hazel. Dave Powers photo. Richard Entwhistle's Super Fly, with O.S. LA .25 power. Flying Lines photo. Gene Pape's Super Clown, powered by the demonstration ASP .25. Flying Lines photo. John Thompson's 17-year-old Super Clown, powered by Fox .35. Flying Lines photo. John Knoppi's Artesian, powered by Fox .35. Flying Lines photo.